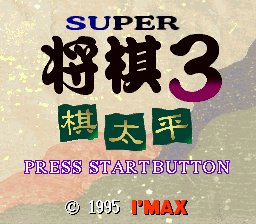 The title is sometimes written as スーパーしょうぎ3. In ファミコン通信 No. 367 the date is listed as 1995-12-22. This is the third in the series, the first is Super Shougi and the second is Super Shougi 2.